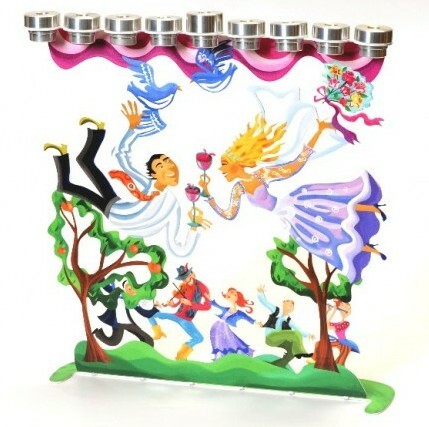 This Hanukkah menorah is fully functional and bears a colorful image featuring Jewish Wedding. Remarkably vivid, this Hanukiah is a great piece of modern Israeli Judaica, a great Hanukkah gift and the perfect home for your Hanukkah candles. The Jewish festival of Hanukkah (also spelled Hanuka or Hannukah, and known in Hebrew as Chanukah) boasts of many symbols: Dreidels (tops), potato latkes (pancakes), sufganiyot (jelly doughnuts) and Hanukkah gifts. However, the Hanukkah menorah (also spelled menora, and known as a Hanukiah, or Chanukia in Hebrew) is definitely the most famous and prominent of them all. The menorah, originally in the shape of a unique nine candled candelabra, has in recent years taken on many original shapes a designs, featuring either candle-holders or accommodating oil for lighting. On the first night one light is kindled, and one is added on each night until on the eighth and final night eight candles shine together in harmony. On each night, an additional light known as the ‘shamash’ (Hebrew for helper or servant) is used to light the other candles, and then displayed alongside them. Israeli artisan and sculptor Marina Zlochin, a creator of top notch Israeli modern Judaica (ceremonial Jewish art), has applied his considerable talent to creating a menorah that is completely functional, as well as dazzling in style and design. Using the latest technology, metal is laser-cut in unique shape, and then silk-screen printed with a dazzling image. Screen printing is an ancient Chinese coloring technique, and in modern times is has developed into a terrific way of producing sharp, colorful dazzling images. It is used to perfection in this dazzling menorah, which really needs to be seen to be believed. 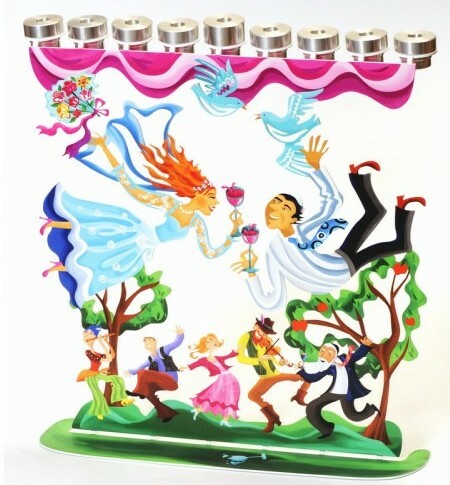 This remarkable piece of Israeli art and modern Judaica is a must-have in any collection of beautiful, original Judaica. It’s the perfect Hanukkah gift, as well as gift on the occasion of a Bar/Bat mitzvah, graduation, anniversary or housewarming.